Recently, looking for a lunchtime accompaniment to my favorite sandwich, I ventured to the vending machine in my office and saw this: First of all, I have no idea why the colors are screwed up like that (I'm bad with the series of tubes), but yes, that is a bag of Burger Kind brand "potato snacks." 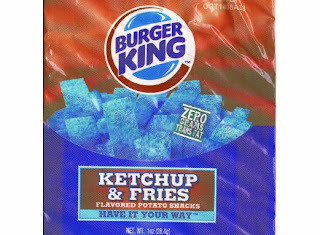 Essentially, they're rectangular-shaped potato chips suffused with the eerily accurate flavor of Burger Kind fries and ketchup. I had no idea the fast-food monarch was extending itself into the world of packaged snacks, why now, but anything that'll help it take down the evil, Cthulu-esque entity that is McDonald's. This is wrong on so many levels. I mean, during my years in Canada, I became intimately familiar with ketchup-flavored potato chips (and several trips to England have introduced me to far stranger varieties of crisps—T-bone steak, prawn cocktail, chicken and stuffing). But these things tasted way, way too much like greasy, lard-encrusted sticks of fluffy potato that you buy to accompany your nine-piece Chicken Tenders. And then, the text on the back of the bag: This is demented. 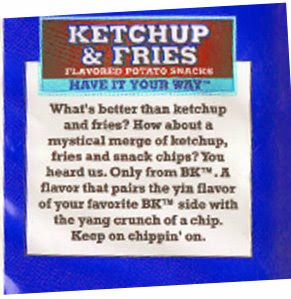 When Burger King incorporates Chinese cosmology into the art of selling vending-machine snacks, you know we're in trouble. But I wonder: Are there advertising agencies that consider this savvy? The way to appeal to that desirable snack-consuming youngster demographic is to get mystical and philosophical about it, in a regular-jerk-at-the-end-of-the-bar sort of way. Anyway, they were ridiculously delicious. I bought another bag three days later. My name is J. I run the website http://www.TheHellQuiz.com. My website lets you take a 3 part Hell test to see what your chances of going to Hell are, and you can post/share your results on your profile/blog. I was just wondering if there is anyway you would be able to put a link to my website from your website, or post something about it. I believe this would be a neat addition to your quiz related website. Please feel free to email me back at, thehellquiz@gmail.com, if this is in anyway possible. *These are here and now advances! - Most automobile title loan specialists need to be paid back inside 30 days. Some allow you up to 60 days. By and by, on the off chance that you have not paid inside the predefined course of events, your credit will "move over" and you will be charged high loan costs and expenses. MySQL generator builds up the sites without utilizing the programming from the database. It is one of the best techniques mysql backup that have helped in producing the sites with no exertion. It is anything but difficult to utilize and furthermore the product is free.